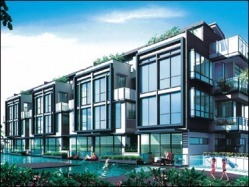 15 exclusive units consisting of 14 semi-detached and 1 detached bungalow set in a resort style environment. Generous living space opening up to the central pool right at the doorstep of every unit. Just a short stroll to Kovan MRT station and a short drive to major expressways - CTE, PIE and KPE. A bustling neighbourhood with popular eateries along Upper Serangoon Road. 3-storey bungalow each with an attic, a basement with 2 car lots and swimming pool.